Namo Mahāmudrāya – homage to Mahāmudrā, the Great Seal of reality. who expounds, in a denuding manner, the diamond strong Vajra sphere of mind, parted from (what can be expressed in) speech, inseparable from Mahāmudrā, the Great Seal of reality, the all-pervasive nature of everything. I shall write some advice concerning Mahāmudrā from the Gelug-Kagyu tradition of the fatherly Dharmavajra (Drupchen Choskyi Dorje), a Mahāsiddha with supreme actual attainment, and his spiritual offspring. Do not have these merely be words from your mouth. direct (toward your root Guru) at least a 100 000 repetitions of the 100-syllable mantra (of Dorje Sempa) and as many hundreds of prostrations as possible, made while reciting The Admission of Downfalls. In addition, make repeated, heartfelt requests to your root Guru inseparable from all Buddhas of the 3 times. The latter is a greatly blissful, clear light mind manifested by such skilful methods as penetrating vital points of the subtle Vajra-body and so forth. The former refers to the ways of meditating on voidness as directly indicated in the expanded, intermediate and brief (Prajñā-Pāramitā Sūtras). Except for this, there is no other pathway of mind leading to liberation. Here I shall give relevant instruction on Mahāmudrā in accord with these intentions of his and discuss the methods that lead you to know the mind, face to face, in keeping with the exposition of the lineage masters. 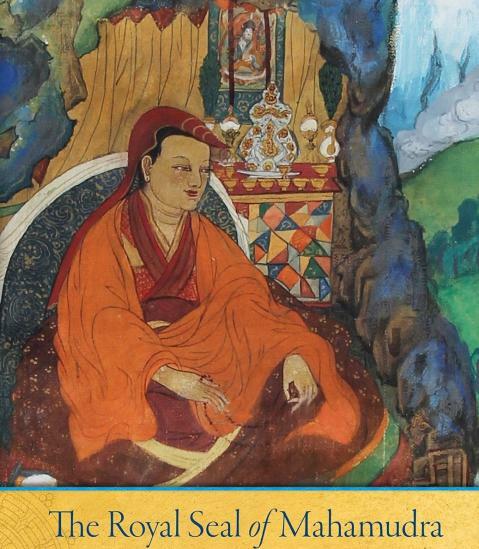 such as those of the simultaneously arising as merged, the amulet box, possessing 5, the 6 spheres of equal taste, the 4 syllables, the pacifier, the object to be cut off, Dzogchen, the discursive Madhyamaka view, and so on. Nevertheless, when scrutinized by a yogi, learned in scripture and logic and experienced (in meditation), their definitive meanings are all seen to come to the same intended point. - (I shall explain) here in accordance with the latter method. with a purely constructive mind, direct (toward your root Guru) your taking of safe direction and the reaffirmation of your Bodhichitta aim. Meditate next on a profound path of Guru-yoga and, after making hundreds of very strong, fervent requests, dissolve your (visualized) Guru into yourself. This does not mean, however, that you cease all attention as if you had fainted or fallen asleep. Rather, you must tie (your attention) to the post of mindfulness in order not to wander, and station alertness to be aware of any mental movement. Whatever thoughts might arise, recognize them as being that and that. Alternatively, like a dueller, cut the thoughts off completely, wham-wham, as soon as they occur. Relax and loosen its firm tightness and there is the set state of mind. there is no doubt that it frees itself. Like these statements, loosen up, but without any wandering. and not established as any form of physical phenomenon, it is, like space, an utter bareness that allows anything to dawn and be vivid. Nevertheless, although the actual nature of mind may be seen straightforwardly, with exceptional perception, to be like that, it cannot be taken as a “this” and be (verbally) indicated. The great meditators of the Snow Mountains are practically of a single opinion in proclaiming that this setting (of the mind) at ease, not cognitively taking (as a “this”) anything that arises, is a guideline instruction for putting within your grasp the forging of Buddhahood. Be that as it may, I, Chokyi Gyaltsen, say that this method is a wondrous skilful means for beginners to accomplish the settling of their mind and is a way for knowing, face to face, (merely) the superficial nature of mind that conceals something deeper. I shall now set out the guideline teachings of my root Guru, Sanggye Yeshe, who (as his name literally means) is (the embodiment of) the Buddhas’ deep awareness: Assuming the guise of a monk clad in saffron, he has eliminated the darkness enshrouding my mind. An individual is not earth, not water, nor fire, nor wind, not space, not consciousness. Nor is he or she all of them. Yet what individual is there separate from these? And just as an individual is not perfectly existent because he or she is (what can be labelled on) a conglomeration of 6 constituents, likewise none of the constituents are perfectly existent because each is (what can be labelled on) a conglomeration (of parts). When you search and, like that, cannot find even a mere atom of a total absorption, someone totally absorbed, and so on, then cultivate absorbed concentration on space-like (voidness), single pointedly, without any wandering. Not established as any form of physical phenomenon, it is a non-obstructive utter bareness that gives rise to the cognitive dawning and projection of a wide variety of things – a continuum of unhindered (unceasing) clarity and awareness, engaging (with objects) without discontinuity. What are called "a continuum" and "a group," such as a rosary, an army, and the like, are not truly (a findable whole). By means of scriptural authority and lines of reasoning (such as this), totally absorb on the lack of existence established as things appear. the deepest sphere of reality is dawning without need to rely on anything else. To immerse your awareness in the state of (this) dawning and totally absorb single-pointedly, oh, my goodness! Within a state of voidness, the lance of awareness is to be twirled around. A correct view (of reality) is not a tangible obstruction, O people of Dingri. All such statements come to the same intended point. At the conclusion (of your meditation), dedicate whatever ennobling, positive force has accrued from meditating on Mahāmudrā, the great seal of reality, as well as your ocean-like network of constructive actions of the 3 times, toward great peerless Enlightenment. inspect minutely its manner of appearance. Its manner of existence will dawn, denuded and distinctly. (This is) the essential point for having whatever has cognitively dawned being like what you recognize. make yourself certain about its manner of existence – don’t grasp at it (to exist in the manner that it appears) – and always sustain (that certainty). Any seer of one phenomenon is the seer of everything. Any voidness of one thing is the voidness of everything. Before the face of proper, total absorption on the actual nature (of everything) like that, there is just the severance of mentally fabricated extremes regarding (everything of) Saṁsāra and Nirvāṇa, such as (inherent, findable) existence, (total) non-existence, and so on. Yet after you have arisen, when you inspect, (you see that) the dependent arising of the functioning of what is merely imputedly existent, simply by names, undeniably and naturally still cognitively dawns, like dreams, mirages, reflections of the moon in water, and illusions. (When you realize simultaneously that) appearances do not obscure voidness and voidness does not make appearances cease, you are manifesting, at that time, the excellent pathway mind (that cognizes from the single viewpoint) of voidness and dependent arising being synonymous. The speaker of these words has been the renunciant called Lobsang Chokyi Gyaltsen, who has listened to much (teaching). By its positive force, may all wandering beings quickly become triumphant Buddhas through this pathway of mind, apart from which there is no second gateway to a state of serenity. They have seen that the 8 transitory things in this (world) are like dramas of madness and now live in remote solitude, following a sagely way of life and taking this pathway of mind as their essential practice. Further, many other disciples, who wish to practice Mahāmudrā at its definitive level, have also requested me. I have compiled the instructions concerning lam-rim (the graded stages of pathway minds) from the Kadam tradition, all the way from entrusting yourself to a spiritual teacher up through Śamatha and Vipaśyanā. But, in the end, I have been unable to set out now, in written words, the ultimate guideline instructions for Mahāmudrā, which are not included among these aforementioned pathways of mind and which are not well known at present to those of the Land of Snows. Thus, what was not set down (in writing) at that time due to the power of its being restricted was intended for a later period. you could never say to those who would (prematurely) write about this method of their own accord that you are Enlightened. If you ask why, it is because those who are guardians for safe direction have regard for the times. and who myself have become a member of this lineage, not letting the close bond of its practice be lost, and who uphold the quintessence teachings of the sūtras and tantras, have compiled this at Ganden Monastery.